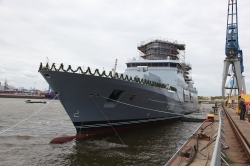 The German Navy’s fourth and final new hybrid F125 frigate Rheinland-Pfalz has launched at the Hamburg site of ThyssenKrupp Marine Systems. 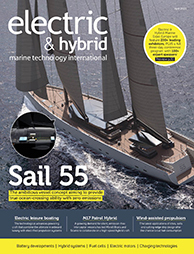 All four of the new F125 frigates employ one GE LM2500 gas turbine, two electric motors and four diesel generator sets in a combined diesel-electric and gas turbine (CODLAG) propulsion arrangement. Sister F125 frigates include Baden-Württemberg, Nordrhein-Westfalen and Sachsen-Anhalt. Rheinland-Pfalz is scheduled to be handed over to the German defence procurement agency BAAINBw in spring 2020. The contract for the F125 programme is worth around US$2bn in total. The four 125 class frigates will begin the replacement of the German Navy’s eight (Bremen type) 122 class frigates. In addition to the traditional tasks of national and alliance defence, the 125 class frigates are designed for conflict prevention, crisis management and intervention/stabilisation operations in the international arena. The ships are capable of remaining at sea for 24 months.